Last week on BURNcast I caught a ride in Jeff's blue-fish taxi to the Zome Mani Padme Zome, an art installation at Burning Man 2009 by Rob Bell, Patricia Algara and Zachary Rutz. In this video we talk to to Rob about how he designed this piece. The spiral is the most ancient symbol found on every civilized continent. The spiral of nature, art, mathematics - a constant form at all scales revolving around itself, ever evolving upward towards syntropy, synergy, life, consciousness and enlightenment. The duality of the spiral embodies the cyclical nature of birth and rebirth and the escape there from. On the Playa, enter the Zome Mani Padme Zome and begin the evolutionary journey; the cycle or birth and rebirth thru a spiral labyrinth of luminarias ever evolving inwards, ever evolving upwards, sometimes setback but ultimately finding the sacred lotus zome at the center - the Bootiesattva. A sacred space where experiences happen. Come with me for a ride on Jeff's sweet Blue Fish taxi! Today we're having a little fun with this awesome photo as submitted by Chai Guy. On our Facebook page we're asking readers to submit a caption for this image. Join us on Facebook and participate! This piece was produced for a new PBS series "Painting and Travel with Roger & Sarah Bansemer" that has yet to be aired. The production value is highly professional. I think it's probably one of the nicest things I've seen come down the pipe in a wee whiley. 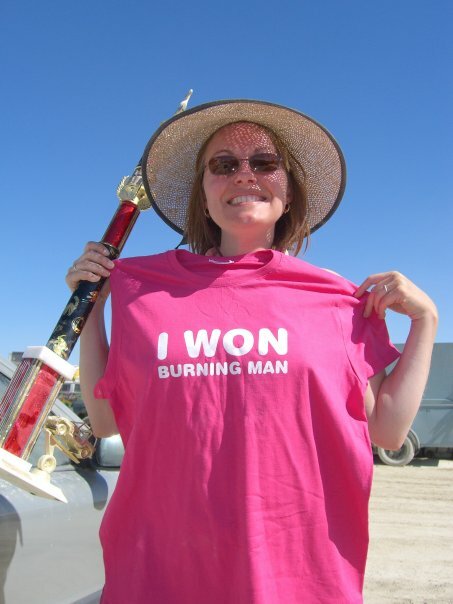 In this episode Roger works on a landscape painting of the Burning Man and Sarah interviews the FlamingLotus Girls who created a large stainless steel sculpture for the event.